automatic knife presented to him by Knife Rights Chairman Doug Ritter (right). Wisconsin FORCE Executive Directer Jeff Nass (left) looks on. Speaking of the new law he was signing, and echoing Ritter's statement that Knife Rights is the Second Front in Defense of the Second Amendment, the governor said, "Wisconsin citizens have the fundamental right to defend themselves and feel safe and secure in their homes and we remain committed to protecting those rights." Bill sponsors Representative Kathleen Bernier and Senator Terry Moulton received specially engraved Allen Elishewitz designed Hogue EX-A01 automatic knives in recognition of their efforts to get this bill passed. Present at the signing was Travis Hakes (standing behind Gov. Walker in photo above), a law enforcement officer and owner of Trigger Control LLC, who first brought the issue of the state's switchblade ban to the attention of Rep. Bernier. He also received one of the Hogue EX-A01 autos to honor his help in providing the spark that ignited the limited legislation which after hard lobbying by Knife Rights and our friends and resulting amendments eventually resulted in full knife law reform in Wisconsin. AB 142 removes all restrictions on switchblades (automatic) knives and concealed carry of all knives from Wisconsin statutes with the single exception that a person who is prohibited under state law from possessing a firearm may also not go armed with a concealed knife that is a "dangerous weapon." Despite some erroneous reports to the contrary, there is no restriction in the statute as to who can now buy, own and carry an automatic knife in Wisconsin. Because the legislature insisted on retaining a limit on concealed carry by a prohibited person, there is some ambiguity as to what knives such a person can carry concealed. What type knife or knives are considered a "dangerous weapon" with respect to the prohibited person restriction is not defined in statute. The Knife Law Preemption aspect of AB 142 repeals and prevents local ordinances more restrictive than state law which only serve to confuse or entrap law-abiding citizens traveling within or through the state. Preemption ensures citizens can expect consistent enforcement of state knife laws everywhere in a state. AB 142 retains political subdivisions' ability to "[prohibit] the possession of a knife in a building, or part of a building, that is owned, occupied, or controlled by the political subdivision." Thanks to Pro-Tech Knives and Hogue for their donation of automatic knives for the signing ceremony. 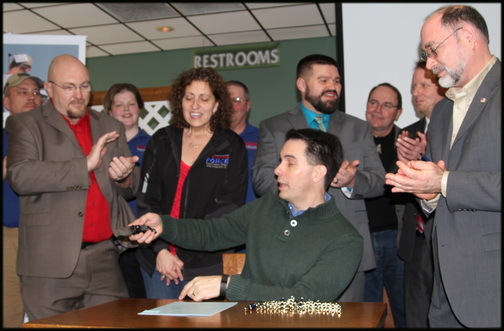 January 21, 2016: Knife Rights' Wisconsin Knife Law Reform Bill including Knife Law Preemption, AB 142, passed unanimously by voice vote yesterday evening in the Senate and is off to Governor Scott Walker for his signature! AB 142 removes all restrictions on switchblades and concealed carry of knives from Wisconsin statutes with the single exception that a person who is prohibited under state law from possessing a firearm may not go armed with a concealed knife that is a "dangerous weapon." Knife Law Preemption means that all laws more restrictive than the new state law will be voided and knife law will be consistent throughout the state. Knife Rights passed the nation's first Knife Law Preemption bill in Arizona in 2010 and has since passed preemption bills in Alaska, Georgia, Kansas, New Hampshire, Oklahoma, Tennessee, Texas and Utah. October 27, 2015: Knife Rights' Wisconsin Knife Law Reform Bill including Knife Law Preemption, AB 142, has passed the Assembly by a voice vote. The Senate version of this bill, SB 102, has passed the Senate Committee on Judiciary and Public Safety and we expect a vote of the full Senate in the coming days. Knife Rights would like to thank the primary sponsor of AB 142, Representative Kathleen Bernier, for her hard work and leadership in getting this Knife Reform Bill passed in the Assembly. Kudos also to her co-sponsors Representatives Joel Kleefisch, James Edming, Bob Gannon, Cody Horlacher, Chris Kapenga, Jesse Kremer, Scott Krug, Thomas Larson, Jeffrey Mursau, John Murtha, Keith Ripp, Jeremy Thiesfeldt and Paul Tittl. We sincerely appreciate their support. June 3, 2015: Working closely with AB 142 sponsor State Representative Kathy Bernier and committee staff, Knife Rights Director of Legislative Affairs, Todd Rathner, was able to facilitate the redraft of the limited "switchblade with CCW" AB 142 into a full blown knife law reform bill. The amended AB142 removes all restrictions on switchblades and concealed carry of knives from Wisconsin statutes with the exception that a person who is prohibited under state law from possessing a firearm may not go armed with a concealed knife that is a "dangerous weapon," and the bll now also includes Knife Law Preemption. AB 142 passed the Assembly Committee on Criminal Justice and Public Safety in a bipartisan vote of 8-2 and now moves to the full Assembly for its consideration. If you live, work or travel in Wisconsin, CALL or EMAIL your Representative and ask them to please vote in favor of AB 142. That's all you need to ask of them, keep it simple and polite. Click here to Find Your Legislator on a map or click here for a listing of the Representatives. Knife rights would like to express our appreciation for the support in this effort being provided by Wisconsin Firearm Owners, Ranges, Clubs & Educators, Inc., the state NRA affiliate. Knife Rights passed the nation's first Knife Law Preemption bill in Arizona in 2010 and has since passed preemption bills in Alaska, Georgia, Kansas, New Hampshire, Tennessee, Texas and Utah. Knife Rights passed the nation's first repeal of a switchblade (automatic) knife ban in 2010 in New Hampshire and has since passed repeal of switchblade bans (and repealed other knife restrictions) in Alaska, Indiana, Kansas, Maine, Missouri, Nevada, Tennessee and Texas. In Washington state knifemakers can now legally manufacture automatic knives. April 27, 2015: The Wisconsin Assembly's Committee on Criminal Justice and Public Safety last week held a hearing on AB142, a bill which as drafted would have repealed the ban on possession of switchblade (automatic) knives and allowed carry by CCW permit holders and law enforcement. Your calls and emails helped to provide support for improving this pro-knife bill, thank you! April 21, 2015: A hearing on Assembly Bill 142 that would ease the ban on switchblade (automatic) knives has been scheduled on Thursday before the Assembly Committee on Criminal Justice and Public Safety. If you live, work or travel in Wisconsin, call or email the Committee Members and ask them to please vote in favor of AB 142. That's all you need to ask of them, keep it simple and polite. 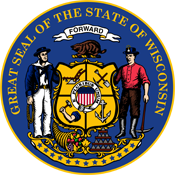 April 14, 2015: A pair of pro-knife bills have been filed in Wisconsin, Assembly Bill 142 and Senate Bill 102, that would amend state law to allow for the manufacture and sale of switchblade (automatic) knives and the possession and carry of autos by "qualified law enforcement officers, qualified former law enforcement officers, and persons who have a license to carry a concealed weapon, including certain out-of-state licenses." In addition it clarifies that assisted-opening folders (which have a bias towards closure) are not switchblades. While we always prefer to eliminate restrictions entirely, this would be a positive development in a state that has not been particularly knife-friendly. As soon as it is appropriate, we will let you know that it is time to call or write Wisconsin legislators on these bills. The bills are sponsored by Representatives Kathleen Bernier, Joel Kleefisch, James Edming, Bob Gannon, Cody Horlacher, Chris Kapenga, Jesse Kremer, Scott Krug, Thomas Larson, Jeffrey Mursau, John Murtha, Keith Ripp, Jeremy Thiesfeldt and Paul Tittl in the Assembly and by Senators Terry Moulton, Van Wanggaard and Sheila Harsdorf in the Senate. The primary sponsors of both bills are members of the Wisconsin Sportsmen's Caucus, as are 12 of 14 sponsors in the Assembly and 2 of 3 in the Senate. The bills have been referred to the respective Committees on Criminal Justice and Public Safety. In the Assembly that committee is Chaired and Co-Chaired by AB 142 sponsors and the Senate committee is Chaired by an SB 102 Sponsor.